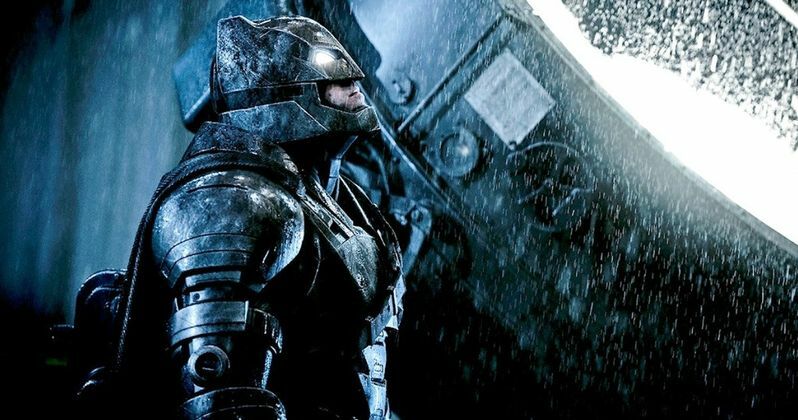 Ben Affleck Directing Batman Standalone Trilogy? Last month, it was revealed that Ben Affleck and DC's chief creative officer Geoff Johns are teaming up to write an Untitled Batman Reboot, which the actor will also star in as Batman and direct. Today we have a new report from Den of Geek, which claims that Warner Bros. and DC have much bigger plans for Ben Affleck's Batman. The studio is now developing a trilogy of stand alone Dark Knight movies, hashing out plans for what is described as a "Golden deal" for the actor/director. The studio recently screened a "near finished cut" of Batman v Superman: Dawn of Justice for the film's crew and studio executives, which was reportedly met with a standing ovation once the credits rolled. This report claims the studio was so impressed with Ben Affleck's performance that they are working out an extended deal with the actor that would lock him in as Batman "for the next 10 years or so." Studio executives reportedly consider the actor as "the definitive Batman," and plan on centering their entire DC movie universe around his character. It isn't known at this point if Ben Affleck will also write and direct the other movies in this trilogy, or what other DC Comics movies the studio plans on using him in. A few months after Batman v Superman hits theaters, the actor will return as Bruce Wayne/Batman in Suicide Squad, set for release on August 5, 2016. After that, he will appear in Justice League Part 1 and Justice League Part 2, which are set for release in 2017 and 2019, respectively. Aside from those movies, Warner Bros. will also put out Wonder Woman, The Flash, Aquaman, Cyborg and Green Lantern between now and 2020. We'll have to see how Batman's interactions with all of these characters unfolds on the big screen, but it's certainly possible that the Caped Crusader could show up in any of these movies. Then again, this report hasn't been confirmed by the studio, so it's possible that these plans aren't even in the works. Ben Affleck is also directing another movie for Warner Bros., Live by Night, which he will also star in alongside Zoe Saldana, Sienna Miller and Elle Fanning. The movie was originally set to be released next October, but the studio is pushing it to 2017. Another Ben Affleck/Warner Bros. movie, The Accountant, is being pushed from January 29, 2016 to the October 7, 2016 date vacated by Live by Night. Neither of these projects have started production yet, and this is the second time Live by Night has been delayed. It was originally scheduled to hit theaters this Christmas, but production was delayed after the actor/filmmaker landed the Batman v Superman: Dawn of Justice role. It is believed that these movies were delayed to give him more time to write the first solo Batman movie with Geoff Johns. Are you glad that the studio is developing a superhero movie trilogy around Ben Affleck's Batman? Let us know what you think, and stay tuned for more updates.